Most employers would agree that employee turnover is one of the largest issues they face year in and year out. With total replacement costs estimated to be as high as 90% to 200% of annual salary, it’s imperative that companies find ways to reduce employee departures. One solution to this that’s often overlooked is rehiring former employees. There are a couple of key benefits to bringing former employees back into the organization. One reason is that it increases the size of your qualified applicant pool during the recruiting process. 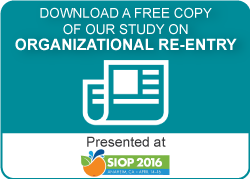 Data collected through our exit surveys indicates that in most cases, over 50% of preventable exits say that they’d likely consider returning to the organization. In cases where there are especially tough-to-fill positions because of a unique combination of a required skill set, or a location that is particularly difficult to staff, opening up your search to former employees significantly increases your pool of qualified candidates. In addition to increasing your candidate pool, another key benefit to rehiring a former employee is a reduction in training costs. Not only will a former employee move through interviews and onboarding more quickly, but the time spent on training will be significantly less. They will already be accustomed to your culture, know your processes and procedures, understand who the key points of contact are, and be familiar with your operating systems. Depending upon how long they have been away from the organization, and how much has changed, the time between being rehired and being productive will be significantly shorter than that of a new hire. Before you can successfully rehire former employees, it’s critical that you have a solid resignation recovery process in place. There are a few decisions you will need to make up front. How will that process look? Who will be having the conversations with employees who have given their notice? How will you conduct their exit interview? Is it up to each individual manager to determine? Is it a responsibility of human resources? Have a predetermined process clearly outlining who you want to work to keep, and who is worth letting go. The key to making sure this process is effective is keeping it consistent. Would you return to this company? Would you return to the same department? Would you return to the same manager? What would it take for you to consider returning? It can be difficult for an exiting employee to share candid feedback, especially to their manager. This is where a third-party exit survey can be especially beneficial. Not only will the employee be more likely to complete it, but they’re more likely to answer openly than if asked by the employer directly. When recruiters are looking at rehiring a former employee, having exit data to work from gives them a way to engage in conversation by immediately addressing the reasons that person left, and what has changed since. For example, that person may have left due to a specific supervisor, but that manager may have since left the company. Or, maybe you’re looking at rehiring this person into a completely different department. Exit data helps the recruiter find out whether or not the reasons a former employee left the company will still be issues in their new role, and if so, address them accordingly. At the time of an employee exit, some managers or department heads feel frustrated or angry, assuming that they’d done everything they could to ensure this employee’s job satisfaction. Not only that, but they’ve invested months or years in training and developing this person, only to have them leave. This can be especially difficult if the person exiting is a strong performer. Holding on to resentment toward a former employee can mean missing out on some great re-entry opportunities. People have myriad reasons for leaving their jobs: advancement opportunity, more money, better hours, a better commute, more flexibility, or quite simply, “the grass looked greener”. As many people often experience, the job they moved on to wasn’t the fit they were hoping for and they may be looking to make their way back to a former employer. Try not to let your old feelings of anger prevent you from rehiring someone who could return to your organization and give several more years of strong performance. You may be missing out on an entire population of former employees who know how you operate, understand your culture, and require very little training. Beyond that, those former employees may be returning with new skills and experience your company could benefit from. Going a step further, don’t be afraid to rehire a rehire. People Element’s research on organizational re-entry shows that rehiring someone up to two times after their initial hire does not have a negative effect on performance or productivity. As you work to improve turnover and retention solutions, consider an often overlooked applicant pool of former employees. Establish a solid resignation recovery process so that you have quality data to work off of as you try to re-engage with employees who have departed the organization. Many former employees are willing to return to your organization, and when they do, will require very little initial training investment, may have potentially beneficial experience from another employer, and a renewed commitment to your company.